Youdong Chen from Tongji University in Shanghai pulls on the rubber gloves, tightens the tourniquet on student Leslie Fairchild’s upper arm, looks for the right vein and, having found it, inserts the needle to remove a blood sample. It all sounds quite routine, but not every hospital in China would allow a medical student to perform such a procedure. No wonder Youdong is delighted to be able to have an opportunity to learn what it feels like to do the job himself – “although I feel sorry for Leslie when I don’t get it quite right,” he says. But here, Youdong does himself an injustice. He was selected for this program by his university, because he is one of the best in his class. LMU held its first Oncology Winter School in 2012. It is designed for eight senior medical students from LMU (for whom the course is free), who are paired with eight from abroad. This year the latter group is made up of participants from Brazil, Russia and South Korea, as well as China. The aim of the course is to acquaint students with everyday routines in an oncology hospital, and to teach them how to conduct difficult consultations with patients. “The focus is on the professional communication of bad news,” says Lisa Lechner of the Medical Faculty’s International Unit. She organizes the Winter School in collaboration with LMU’s Munich International Summer University (MISU). The patients in these encounters are played by professional actors who have been prepared for their roles by experienced doctors. Following each encounter, the student receives feedback from their mentors on how the consultation went. Leslie is Youdong’s study buddy. She translates the specialized terminology into English, answers queries about the structure and organization of medical education at LMU and explains the German healthcare system. Youdong is particularly interested in the German approach to health insurance, in the growing importance of immunotherapies in oncology and in palliative medicine. Leslie’s role as a ‘peer teacher’ in the Winter School allows her to share her own clinical experiences with the international students, which effectively enables her to broaden her skills. “I found the combination of everyday routines on the wards with the teaching role appealing and interesting,” she says, and the interactions with the students and with Professor Martin Dreyling of Munich University Hospitals were also very stimulating and enriching, she adds. In 2015, LMU added a four-week course in Neurology to its Winter School schedule. This program takes in neuroscience, neurosurgery, neuroradiology and psychology, but in terms of its structure it follows the same model as the Oncology program. The mornings are taken up with ward visits and teaching rounds, and the students attend seminars given by specialists and take part in training sessions. “The Neurology Winter School also exposes participants to a wide range of specialist disciplines,” says Lechner, as visits to the German Center for Vertigo and Vestibular Disorders and the Institute for Stroke and Dementia Research are on the agenda, together with a trip to the Schön Clinic for Therapeutic Neurology in Bad Aibling. Excursions are an integral part of most Winter Schools. Together with their local partners, the international contingent visits popular destinations such as Nuremberg and Neuschwanstein Castle, in addition to the city of Munich itself, of course. However, Youdong particularly remembers his visit to the site of the former concentration camp in Dachau. Many of the students themselves organize day-trips of their own. “Over the years, participants have been taken to concerts, international potluck dinners and even a few student parties,” Lechner recalls. The organizers welcome these initiatives, as they enable the local students to acquire intercultural skills, while improving their own command of English and intensifying contacts with LMU’s partner universities. 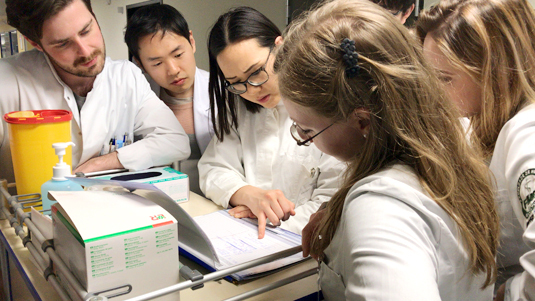 The youngest of LMU’s Medical Winter Schools was first organized by the Institute for Medical Information Processing, Biometry and Epidemiology (IBE) in 2013, and it centers on Clinical and Genetic Epidemiology. This is a 2-week course designed for Master’s and PhD students. In the latest intake were 15 students of biology, psychology and medicine from, among other countries, the US, Egypt, Macedonia, Hungary, Kenya and of course the home team. This course is led by Professor Konstantin Strauch and Professor Ulrich Mansmann of the IBE, and is devoted to topics such as tumor genomics, metabolomics, pharmacogenomics, translational medicine, as well as ethical aspects of clinical and genetic epidemiology. The next round of MISU Summer Schools will soon get under way. The Schools covers a wide range of subjects, and some are open to LMU students also. For further information, see the MISU Webpage.